activate the service," says Sam Schell, Senior Vice President of Business Development for Pace International. "Dealers have told us they like this program and have found it useful in selling more DISH products." Along with on-site training and support, Pace International offers webinars to dealers. This is a great option for dealers that need to get up to speed quickly but don't necessarily require as much hands-on training that comes with in-person sessions. Ultimately, dealers have a variety of sales training and support options to fit their needs. Whether a dealer prefers interactive, on-site training, a remote webinar or the help of support staff, Pace International can help dealers master the learning curve and sell the customer experience. 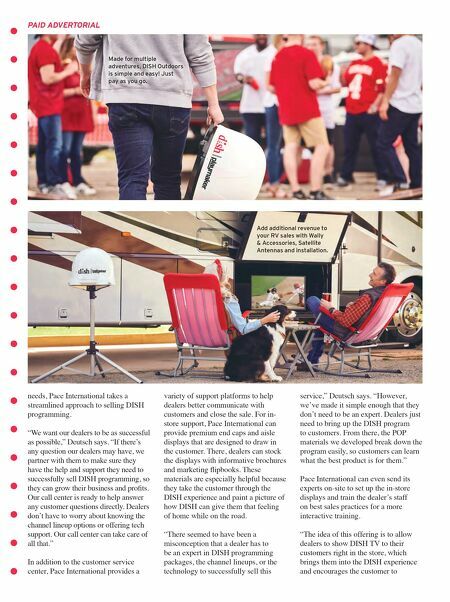 Learn More About Offering DISH Programming For dealers interested in growing their profit margins by selling DISH programming, they can meet Pace International, which is the 2018 recipient of the RVIA Supplier of the Year Award, at the March 12-14 RVX show in Salt Lake City, as a partner of DISH Outdoors who is this year's Reveal sponsor. At the RVX Reveal, dealers will get a first look at the newest products that can drive sales and help them reach a new generation of customers. DISH and Pace International will be in booth 1037 to answer any additional questions. 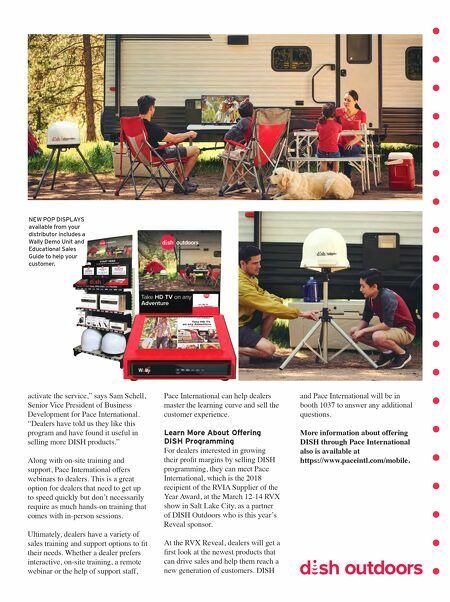 More information about offering DISH through Pace International also is available at https://www.paceintl.com/mobile. NEW POP DISPLAYS available from your distributor includes a Wally Demo Unit and Educational Sales Guide to help your customer.